Scotland is one of the oldest countries in the world with a rich, diverse past. The nation’s recorded history began with the arrival of the Roman Empire in the 1st century, when the province of Britannia reached as far north as the line between the firths of Clyde to the Forth. In A Short History of Scotland, historian and journalist Andrew Lang provides a concise and comprehensive survey rife with action, high drama and centuries of turbulence that have helped to shape modern Scotland. 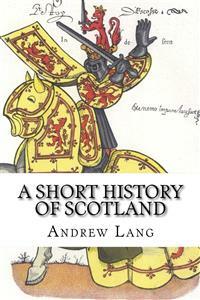 A Short History of Scotland by Andrew Lang. First published in 1911. This edition published 2017 by Enhanced Media. All rights reserved. If we could see in a magic mirror the country now called Scotland as it was when the Romans under Agricola (81 A.D.) crossed the Border, we should recognise little but the familiar hills and mountains. The rivers, in the plains, overflowed their present banks; dense forests of oak and pine, haunted by great red deer, elks, and boars, covered land that has long been arable. There were lakes and lagoons where for centuries there have been fields of corn. On the oldest sites of our towns were groups of huts made of clay and wattle, and dominated, perhaps, by the large stockaded house of the tribal prince. In the lochs, natural islands, or artificial islets made of piles (crannogs), afforded standing-ground and protection to villages, if indeed these lake-dwellings are earlier in Scotland than the age of war that followed the withdrawal of the Romans. In these “epics” the manners much resemble those described by Homer. Like his heroes, the men in the Cuchullain sagas fight from light chariots, drawn by two ponies, and we know that so fought the tribes in Scotland encountered by Agricola the Roman General (81-85 A.D.) It is even said in the Irish epics that Cuchullain learned his chariotry in Alba—that is, in our Scotland. The warriors had “mighty limbs and flaming hair,” says Tacitus. Their weapons were heavy iron swords, in bronze sheaths beautifully decorated, and iron-headed spears; they had large round bronze-studded shields, and battle-axes. The dress consisted of two upper garments: first, the smock, of linen or other fabric—in battle, often of tanned hides of animals,—and the mantle, or plaid, with its brooch. Golden torques and heavy gold bracelets were worn by the chiefs; the women had bronze ornaments with brightly coloured enamelled decoration. Such were the people in Alba whom we can dimly descry around Agricola’s fortified frontier between the firths of Forth and Clyde, about 81-82 A.D. When Agricola pushed north of the Forth and Tay he still met men who had considerable knowledge of the art of war. In his battle at Mons Graupius (perhaps at the junction of Isla and Tay), his cavalry had the better of the native chariotry in the plain; and the native infantry, descending from their position on the heights, were attacked by his horsemen in their attempt to assail his rear. But they were swift of foot, the woods sheltered and the hills defended them. He made no more effectual pursuit than Cumberland did at Culloden. After the retreat from the Antonine Vallum, about 190, we hear of the vigorous “unrest” of the Meatæ and Caledonians; the latter people are said, on very poor authority, to have been little better than savages. Against them Severus (208) made an expedition indefinitely far to the north, but the enemy shunned a general engagement, cut off small detachments, and caused the Romans terrible losses in this march to a non-existent Moscow. Not till 306 do we hear of the Picts, about whom there is infinite learning but little knowledge. They must have spoken Gaelic by Severus’s time (208), whatever their original language; and were long recognised in Galloway, where the hill and river names are Gaelic. Rome has left traces of her presence on Scottish soil—vestiges of the forts and vallum wall between the firths; a station rich in antiquities under the Eildons at Newstead; another, Ardoch, near Sheriffmuir; a third near Solway Moss (Birrenswark); and others less extensive, with some roads extending towards the Moray Firth; and a villa at Musselburgh, found in the reign of James VI. To the Scots, through St Columba, who, about 563, settled in Iona, and converted the Picts as far north as Inverness, we owe the introduction of Christianity, for though the Roman Church of St Ninian (397), at Whithern in Galloway, left embers of the faith not extinct near Glasgow, St Kentigern’s country, till Columba’s time, the rites of Christian Scotland were partly of the Celtic Irish type, even after St Wilfrid’s victory at the Synod of Whitby (664). St Columba himself was of the royal line in Ulster, was learned, as learning was then reckoned, and, if he had previously been turbulent, he now desired to spread the Gospel. With twelve companions he settled in Iona, established his cloister of cells, and journeyed to Inverness, the capital of Pictland. Here his miracles overcame the magic of the King’s druids; and his Majesty, Brude, came into the fold, his people following him. Columba was no less of a diplomatist than of an evangelist. In a crystal he saw revealed the name of the rightful king of the Dalriad Scots in Argyll—namely, Aidan—and in 575, at Drumceat in North Ireland, he procured the recognition of Aidan, and brought the King of the Picts also to confess Aidan’s independent royalty. In the ‘Life of Columba,’ by Adamnan, we get a clear and complete view of everyday existence in the Highlands during that age. We are among the red deer, and the salmon, and the cattle in the hills, among the second-sighted men, too, of whom Columba was far the foremost. We see the saint’s inkpot upset by a clumsy but enthusiastic convert; we even make acquaintance with the old white pony of the monastery, who mourned when St Columba was dying; while among secular men we observe the differences in rank, measured by degrees of wealth in cattle. Many centuries elapse before, in Froissart, we find a picture of Scotland so distinct as that painted by Adamnan. The discipline of St Columba was of the monastic model. There were settlements of clerics in fortified villages; the clerics were a kind of monks, with more regard for abbots than for their many bishops, and with peculiar tonsures, and a peculiar way of reckoning the date of Easter. Each missionary was popularly called a Saint, and the Kil, or cell, of many a Celtic missionary survives in hundreds of place-names. The salt-water Loch Leven in Argyll was on the west the south frontier of “Pictland,” which, on the east, included all the country north of the Firth of Forth. From Loch Leven south to Kintyre, a large cantle, including the isles, was the land of the Scots from Ireland, the Dalriadic kingdom. The south-west, from Dumbarton, including our modern Cumberland and Westmorland, was named Strathclyde, and was peopled by British folk, speaking an ancient form of Welsh. On the east, from Ettrick forest into Lothian, the land was part of the early English kingdom of Bernicia; here the invading Angles were already settled—though river-names here remain Gaelic, and hill-names are often either Gaelic or Welsh. The great Northern Pictland was divided into seven provinces, or sub-kingdoms, while there was an over-King, or Ardrigh, with his capital at Inverness and, later, in Angus or Forfarshire. The country about Edinburgh was partly English, partly Cymric or Welsh. The south-west corner, Galloway, was called Pictish, and was peopled by Gaelic-speaking tribes. In a work of this scope, it is impossible to describe all the wars between the petty kingdoms peopled by races of various languages, which occupied Scotland. In 603, in the wild moors at Degsastane, between the Liddel burn and the passes of the Upper Tyne, the English Aethelfrith of Deira, with an army of the still pagan ancestors of the Borderers, utterly defeated Aidan, King of Argyll, with the Christian converted Scots. Henceforth, for more than a century, the English between Forth and Humber feared neither Scot of the west nor Pict of the north. On the death of Aethelfrith (617), the Christian west and north exercised their influences; one of Aethelfrith’s exiled sons married a Pictish princess, and became father of a Pictish king, another, Oswald, was baptised at Iona; and the new king of the northern English of Lothian, Edwin, was converted by Paullinus (627), and held Edinburgh as his capital. Later, after an age of war and ruin, Oswald, the convert of Iona, restored Christianity in northern England; and, after his fall, his brother, Oswiu, consolidated the north English. In 685 Oswiu’s son Egfrith crossed the Forth and invaded Pictland with a Northumbrian army, but was routed with great loss, and was slain at Nectan’s Mere, in Forfarshire. Thenceforth, till 761, the Picts were dominant, as against Scots and north English, Angus MacFergus being then their leader (731-761). Now the invaders and settlers from Scandinavia, the Northmen on the west coast, ravaged the Christian Scots of the west, and burned Iona: finally, in 844-860, Kenneth MacAlpine of Kintyre, a Scot of Dalriada on the paternal, a Pict on the mother’s side, defeated the Picts and obtained their throne. By Pictish law the crown descended in the maternal line, which probably facilitated the coronation of Kenneth. To the Scots and “to all Europe” he was a Scot; to the Picts, as son of a royal Pictish mother, he was a Pict. With him, at all events, Scots and Picts were interfused, and there began the Scottish dynasty, supplanting the Pictish, though it is only in popular tales that the Picts were exterminated. The line of Kenneth MacAlpine, though disturbed by quarrels over the succession, and by Northmen in the west, north, and east, none the less in some way “held a good grip o’ the gear” against Vikings, English of Lothian, and Welsh of Strathclyde. In consequence of a marriage with a Welsh princess of Strathclyde, or Cumberland, a Scottish prince, Donald, brother of Constantine II., became king of that realm (908), and his branch of the family of MacAlpin held Cumbria for a century. In 924 the first claim by an English king, Edward, to the over-lordship of Scotland appears in the Anglo-Saxon Chronicle. The entry contains a manifest error, and the topic causes war between modern historians, English and Scottish. In fact, there are several such entries of Scottish acceptance of English suzerainty under Constantine II., and later, but they all end in the statement, “this held not long.” The “submission” of Malcolm I. to Edmund (945) is not a submission but an alliance; the old English word for “fellow-worker,” or “ally,” designates Malcolm as fellow-worker with Edward of England. The main fact is that out of these and similar dim transactions arose the claims of Edward I. to the over-lordship of Scotland,—claims that were urged by Queen Elizabeth’s minister, Cecil, in 1568, and were boldly denied by Maitland of Lethington. From these misty pretensions came the centuries of war that made the hardy character of the folk of Scotland. We cannot pretend within our scope to follow chronologically “the fightings and flockings of kites and crows,” in “a wolf-age, a war-age,” when the Northmen from all Scandinavian lands, and the Danes, who had acquired much of Ireland, were flying at the throat of England and hanging on the flanks of Scotland; while the Britons of Strathclyde struck in, and the Scottish kings again and again raided or sought to occupy the fertile region of Lothian between Forth and Tweed. If the dynasty of MacAlpin could win rich Lothian, with its English-speaking folk, they were “made men,” they held the granary of the North. By degrees and by methods not clearly defined they did win the Castle of the Maidens, the acropolis of Dunedin, Edinburgh; and fifty years later, in some way, apparently by the sword, at the battle of Carham (1018), in which a Scottish king of Cumberland fought by his side, Malcolm II. took possession of Lothian, the whole south-east region, by this time entirely anglified, and this was the greatest step in the making of Scotland. The Celtic dynasty now held the most fertile district between Forth and Tweed, a district already English in blood and speech, the centre and focus of the English civilisation accepted by the Celtic kings. Under this Malcolm, too, his grandson, Duncan, became ruler of Strathclyde—that is, practically, of Cumberland. Malcolm is said to have been murdered at haunted Glamis, in Forfarshire, in 1034; the room where he died is pointed out by legend in the ancient castle. His rightful heir, by the strange system of the Scots, should have been, not his own grandson, Duncan, but the grandson of Kenneth III. The rule was that the crown went alternately to a descendant of the House of Constantine (863-877), son of Kenneth MacAlpine, and to a descendant of Constantine’s brother, Aodh (877-888). These alternations went on till the crowning of Malcolm II. (1005-1034), and then ceased, for Malcolm II. had slain the unnamed male heir of the House of Aodh, a son of Boedhe, in order to open the succession to his own grandson, “the gracious Duncan.” Boedhe had left a daughter, Gruach; she had by the Mormaor, or under-king of the province of Murray, a son, Lulach. On the death of the Mormaor she married Macbeth, and when Macbeth slew Duncan (1040), he was removing a usurper—as he understood it—and he ruled in the name of his stepson, Lulach. The power of Duncan had been weakened by repeated defeats at the hands of the Northmen under Thorfinn. In 1057 Macbeth was slain in battle at Lumphanan, in Aberdeenshire, and Malcolm Canmore, son of Duncan, after returning from England, whither he had fled from Macbeth, succeeded to the throne. But he and his descendants for long were opposed by the House of Murray, descendants of Lulach, who himself had died in 1058. The world will always believe Shakespeare’s version of these events, and suppose the gracious Duncan to have been a venerable old man, and Macbeth an ambitious Thane, with a bloodthirsty wife, he himself being urged on by the predictions of witches. He was, in fact, Mormaor of Murray, and upheld the claims of his stepson Lulach, who was son of a daughter of the wrongfully extruded House of Aodh. Malcolm Canmore, Duncan’s grandson, on the other hand, represented the European custom of direct lineal succession against the ancient Scots’ mode. The reign of Malcolm Canmore (1057-1093) brought Scotland into closer connection with western Europe and western Christianity. The Norman Conquest (1066) increased the tendency of the English-speaking people of Lothian to acquiesce in the rule of a Celtic king, rather than in that of the adventurers who followed William of Normandy. Norman operations did not at first reach Cumberland, which Malcolm held; and, on the death of his Norse wife, the widow of Duncan’s foe, Thorfinn (she left a son, Duncan), Malcolm allied himself with the English Royal House by marrying Margaret, sister of Eadgar Ætheling, then engaged in the hopeless effort to rescue northern England from the Normans. The dates are confused: Malcolm may have won the beautiful sister of Edgar, rightful king of England, in 1068, or at the time (1070) of his raid, said to have been of savage ferocity, into Northumberland, and his yet more cruel reprisals for Gospatric’s harrying of Cumberland. In either case, St Margaret’s biographer, who had lived at her Court, whether or not he was her Confessor, Turgot, represents the Saint as subduing the savagery of Malcolm, who passed wakeful nights in weeping for his sins. A lover of books, which Malcolm could not read, an expert in “the delicate, and gracious, and bright works of women,” Margaret brought her own gentleness and courtesy among a rude people, built the abbey church of Dunfermline, and presented the churches with many beautiful golden reliquaries and fine sacramental plate. In 1072, to avenge a raid of Malcolm (1070), the Conqueror, with an army and a fleet, came to Abernethy on Tay, where Malcolm, in exchange for English manors, “became his man” for them, and handed over his son Duncan as a hostage for peace. The English view is that Malcolm became William’s “man for all that he had”—or for all south of Tay. After various raidings of northern England, and after the death of the Conqueror, Malcolm renewed, in Lothian, the treaty of Abernethy, being secured in his twelve English manors (1091). William Rufus then took and fortified Carlisle, seized part of Malcolm’s lands in Cumberland, and summoned him to Gloucester, where the two Kings, after all, quarrelled and did not meet. No sooner had Malcolm returned home than he led an army into Northumberland, where he was defeated and slain, near Alnwick (Nov. 13, 1093). His son Edward fell with him, and his wife, St Margaret, died in Edinburgh Castle: her body, under cloud of night, was carried through the host of rebel Celts and buried at Dunfermline. Margaret, a beautiful and saintly Englishwoman, had been the ruling spirit of the reign in domestic and ecclesiastical affairs. She had civilised the Court, in matters of costume at least; she had read books to the devoted Malcolm, who could not read; and he had been her interpreter in her discussions with the Celtic-speaking clergy, whose ideas of ritual differed from her own. The famous Culdees, originally ascetic hermits, had before this day united in groups living under canonical rules, and, according to English observers, had ceased to be bachelors. Masses are said to have been celebrated by them in some “barbarous rite”; Saturday was Sabbath; on Sunday men worked. Lent began, not on Ash Wednesday, but on the Monday following. We have no clearer account of the Culdee peculiarities that St Margaret reformed. The hereditary tenure of benefices by lay protectors she did not reform, but she restored the ruined cells of Iona, and established hospitia for pilgrims. She was decidedly unpopular with her Celtic subjects, who now made a struggle against English influences. In the year of her death died Fothadh, the last Celtic bishop of St Andrews, and the Celtic clergy were gradually superseded and replaced by monks of English name, English speech, and English ideas—or rather the ideas of western Europe. Scotland, under Margaret’s influence, became more Catholic; the celibacy of the clergy was more strictly enforced (it had almost lapsed), but it will be observed throughout that, of all western Europe, Scotland was least overawed by Rome. Yet for centuries the Scottish Church was, in a peculiar degree, “the daughter of Rome,” for not till about 1470 had she a Metropolitan, the Archbishop of St Andrews. On the deaths, in one year, of Malcolm, Margaret, and Fothadh, the last Celtic bishop of St Andrews, the see for many years was vacant or merely filled by transient bishops. York and Canterbury were at feud for their superiority over the Scottish Church; and the other sees were not constituted and provided with bishops till the years 1115 (Glasgow), 1150,—Argyll not having a bishop till 1200. In the absence of a Metropolitan, episcopal elections had to be confirmed at Rome, which would grant no Metropolitan, but forbade the Archbishop of York to claim a superiority which would have implied, or prepared the way for, English superiority over Scotland. Meanwhile the expenses and delays of appeals from bishops direct to Rome did not stimulate the affection of the Scottish “daughter of Rome.” The rights of the chapters of the Cathedrals to elect their bishops, and other appointments to ecclesiastical offices, in course of time were transferred to the Pope, who negotiated with the king, and thus all manner of jobbery increased, the nobles influencing the king in favour of their own needy younger sons, and the Pope being amenable to various secular persuasions, so that in every way the relations of Scotland with the Holy Father were anomalous and irksome. On the death of Malcolm the contest for the Crown lay between his brother, Donald Ban, supported by the Celts; his son Duncan by his first wife, a Norse woman (Duncan being then a hostage at the English Court, who was backed by William Rufus); and thirdly, Malcolm’s eldest son by Margaret, Eadmund, the favourite with the anglicised south of the country. Donald Ban, after a brief period of power, was driven out by Duncan (1094); Duncan was then slain by the Celts (1094). Donald was next restored, north of Forth, Eadmund ruling in the south, but was dispossessed and blinded by Malcolm’s son Eadgar, who reigned for ten years (1097-1107), while Eadmund died in an English cloister. Eadgar had trouble enough on all sides, but the process of anglicising continued, under himself, and later, under his brother, Alexander I., who ruled north of Forth and Clyde; while the youngest brother, David, held Lothian and Cumberland, with the title of Earl. The sister of those sons of Malcolm, Eadgyth (Matilda), married Henry I. of England in 1100. There seemed a chance that, north of Clyde and Forth, there would be a Celtic kingdom; while Lothian and Cumbria would be merged in England. Alexander was mainly engaged in fighting the Moray claimants of his crown in the north and in planting his religious houses, notably St Andrews, with English Augustinian canons from York. Canterbury and York contended for ecclesiastical superiority over Scotland; after various adventures, Robert, the prior of the Augustinians at Scone, was made Bishop of St Andrews, being consecrated by Canterbury, in 1124; while York consecrated David’s bishop in Glasgow. Thanks to the quarrels of the sees of York and Canterbury, the Scottish clergy managed to secure their ecclesiastical independence from either English see; and became, finally, the most useful combatants in the long struggle for the independence of the nation. Rome, on the whole, backed that cause. The Scottish Catholic churchmen, in fact, pursued the old patriotic policy of resistance to England till the years just preceding the Reformation, when the people leaned to the reformed doctrines, and when Scottish national freedom was endangered more by France than by England. With the death of Alexander I. (April 25, 1124) and the accession of his brother, David I., the deliberate Royal policy of introducing into Scotland English law and English institutions, as modified by the Norman rulers, was fulfilled. David, before Alexander’s death, was Earl of the most English part of Lothian, the country held by Scottish kings, and Cumbria; and resided much at the court of his brother-in-law, Henry I. He associated, when Earl, with nobles of Anglo-Norman race and language, such as Moreville, Umfraville, Somerville, Gospatric, Bruce, Balliol, and others; men with a stake in both countries, England and Scotland. On coming to the throne, David endowed these men with charters of lands in Scotland. With him came a cadet of the great Anglo-Breton House of FitzAlan, who obtained the hereditary office of Seneschal or Steward of Scotland. His patronymic, FitzAlan, merged in Stewart (later Stuart), and the family cognizance, the fesse chequy in azure and argent, represents the Board of Exchequer. The earliest Stewart holdings of land were mainly in Renfrewshire; those of the Bruces were in Annandale. These two Anglo-Norman houses between them were to found the Stewart dynasty. The wife of David, Matilda, widow of Simon de St Liz, was heiress of Waltheof, sometime the Conqueror’s Earl in Northumberland; and to gain, through that connection, Northumberland for himself was the chief aim of David’s foreign policy,—an aim fertile in contentions. We have not space to disentangle the intricacies of David’s first great domestic struggles; briefly, there was eternal dispeace caused by the Celts, headed by claimants to the throne, the MacHeths, representing the rights of Lulach, the ward of Macbeth. In 1130 the Celts were defeated, and their leader, Angus, Earl of Moray, fell in fight near the North Esk in Forfarshire. His brother, Malcolm, by aid of David’s Anglo-Norman friends, was taken and imprisoned in Roxburgh Castle. The result of this rising was that David declared the great and ancient Celtic Earldom of Moray—the home of his dynastic Celtic rivals—forfeit to the Crown. He planted the region with English, Anglo-Norman, and Lowland landholders, a great step in the anglicisation of his kingdom. Thereafter, for several centuries, the strength of the Celts lay in the west in Moidart, Knoydart, Morar, Mamore, Lochaber, and Kintyre, and in the western islands, which fell into the hands of “the sons of Somerled,” the Macdonalds. In a military sense, the fact that here the men-at-arms and knights of England fought as dismounted infantry, their horses being held apart in reserve, is notable as preluding to the similar English tactics in their French wars of the fourteenth and fifteenth centuries. Thus arrayed, the English received the impetuous charge of the wild Galloway men, not in armour, who claimed the right to form the van, and broke through the first line only to die beneath the spears of the second. But Prince David with his heavy cavalry scattered the force opposed to him, and stampeded the horses of the English that were held in reserve. This should have been fatal to the English, but Henry, like Rupert at Marston Moor, pursued too far, and the discipline of the Scots was broken by the cry that their King had fallen, and they fled. David fought his way to Carlisle in a series of rearguard actions, and at Carlisle was joined by Prince Henry with the remnant of his men-at-arms. It was no decisive victory for England. In the following year (1139) David got what he wanted. His son Henry, by peaceful arrangement, received the Earldom of Northumberland, without the two strong places, Bamborough and Newcastle. Through the anarchic weakness of Stephen’s reign, Scotland advanced in strength and civilisation despite a Celtic rising headed by a strange pretender to the rights of the MacHeths, a “brother Wimund”; but all went with the death of David’s son, Prince Henry, in 1152. Of the prince’s three sons, the eldest, Malcolm, was but ten years old; next came his brothers William (“the Lion”) and little David, Earl of Huntingdon. From this David’s daughters descended the chief claimants to the Scottish throne in 1292—namely, Balliol, Bruce, and Comyn: the last also was descended, in the female line, from King Donald Ban, son of Malcolm Canmore. David had done all that man might do to settle the crown on his grandson Malcolm; his success meant that standing curse of Scotland, “Woe to the kingdom whose king is a child,”—when, in a year, David died at Carlisle (May 24, 1153). The result of the domestic policy of David was to bring all accessible territory under the social and political system of western Europe, “the Feudal System.” Its principles had been perfectly familiar to Celtic Scotland, but had rested on a body of traditional customs (as in Homeric Greece), rather than on written laws and charters signed and sealed. Among the Celts the local tribe had been, theoretically, the sole source of property in land. In proportion as they were near of kin to the recognised tribal chief, families held lands by a tenure of three generations; but if they managed to acquire abundance of oxen, which they let out to poorer men for rents in kind and labour, they were apt to turn the lands which they held only temporarily, “in possession,” into real permanent property. The poorer tribesmen paid rent in labour or “services,” also in supplies of food and manure. The Celtic tenants also paid military service to their superiors. The remotest kinsmen of each lord of land, poor as they might be, were valued for their swords, and were billeted on the unfree or servile tenants, who gave them free quarters. In the feudal system of western Europe these old traditional customs had long been modified and stereotyped by written charters. The King gave gifts of land to his kinsmen or officers, who were bound to be “faithful” (fideles); in return the inferior did homage, while he received protection. From grade to grade of rank and wealth each inferior did homage to and received protection from his superior, who was also his judge. In this process, what had been the Celtic tribe became the new “thanage”; the Celtic king (righ) of the tribe became the thane; the province or group of tribes (say Moray) became the earldom; the Celtic Mormaer of the province became the earl; and the Crown appointed vice-comites, sub-earls, that is sheriffs, who administered the King’s justice in the earldom. Under David, where his rule extended, society was divided broadly into three classes—Nobles, Free, Unfree. All holders of “a Knight’s fee,” or part of one, holding by free service, hereditarily, and by charter, constituted the communitas of the realm (we are to hear of the communitas later), and were free, noble, or gentle,—men of coat armour. The “ignoble,” “not noble,” men with no charter from the Crown, or Earl, Thane, or Church, were, if lease-holders, though not “noble,” still “free.” Beneath them were the “unfree” nativi, sold or given with the soil. The old Celtic landholders were not expropriated, as a rule, except where Celtic risings, in Galloway and Moray, were put down, and the lands were left in the King’s hands. Often, when we find territorial surnames of families, “de” “of” this place or that,—the lords are really of Celtic blood with Celtic names; disguised under territorial titles; and finally disused. But in Galloway and Ayrshire the ruling Celtic name, Kennedy, remains Celtic, while the true Highlands of the west and northwest retained their native magnates. Thus the Anglicisation, except in very rebellious regions, was gradual. There was much less expropriation of the Celt than disguising of the Celt under new family names and regulation of the Celt under written charters and leases. David I was, according to James VI, nearly five centuries later, “a sair saint for the Crown.” He gave Crown-lands in the southern lowlands to the religious orders with their priories and abbeys; for example, Holyrood, Melrose, Jedburgh, Kelso, and Dryburgh—centres of learning and art and of skilled agriculture. Probably the best service of the regular clergy to the State was its orderliness and attention to agriculture, for the monasteries did not, as in England, produce many careful chroniclers and historians. Each abbey had its lands divided into baronies, captained by a lay “Church baron” to lead its levies in war. The civil centre of the barony was the great farm or grange, with its mill, for in the thirteenth century the Lowlands had water-mills which to the west Highlands were scarcely known in 1745, when the Highland husbandmen were still using the primitive hand-quern of two circular stones. Near the mill was a hamlet of some forty cottages; each head of a family had a holding of eight or nine acres and pasturage for two cows, and paid a small money rent and many arduous services to the Abbey. The tenure of these cottars was, and under lay landlords long remained, extremely precarious; but the tenure of the “bonnet laird” (hosbernus) was hereditary. Below even the free cottars were the unfree serfs or nativi, who were handed over, with the lands they tilled, to the abbeys by benefactors: the Church was forward in emancipating these serfs; nor were lay landlords backward, for the freed man was useful as a spear-man in war. We have only to look at the many now ruined abbeys of the Border to see the extent of civilisation under David I., and the relatively peaceful condition, then, of that region which later became the cockpit of the English wars, and the home of the raiding clans, Scotts, Elliots, and Armstrongs, Bells, Nixons, Robsons, and Croziers. As there was no fixed capital, the King’s Court, in David’s time, followed the King in his annual circuits through his realm, between Dumfries and Inverness. Later, the regions of Scotia (north of Forth), Lothian, and the lawless realm of Galloway, had their Grand Justiciaries, who held the Four Pleas. The other pleas were heard in “Courts of Royalty” and by earls, bishops, abbots, down to the baron, with his “right of pit and gallows.” At such courts, by a law of 1180, the Sheriff of the shire, or an agent of his, ought to be present; so that royal and central justice was extending itself over the minor local courts. But if the sheriff or his sergeant did not attend when summoned, local justice took its course. The process initiated by David’s son, William the Lion, was very slowly substituting the royal authority, the royal sheriffs of shires, juries, and witnesses, for the wild justice of revenge; and trial by ordeal, and trial by combat. But hereditary jurisdictions of nobles and gentry were not wholly abolished till after the battle of Culloden! Where Abbots held courts, their procedure, in civil cases, was based on laws sanctioned by popes and general councils. But, alas! the Abbot might give just judgment; to execute it, we know from a curious instance, was not within his power, if the offender laughed at a sentence of excommunication. David and his successors, till the end of the thirteenth century, made Scotland a more civilised and kept it a much less disturbed country than it was to remain during the long war of Independence, while the beautiful abbeys with their churches and schools attested a high stage of art and education. The prominent facts in the brief reign of David’s son Malcolm the Maiden, crowned (1153) at the age of eleven, were, first, a Celtic rising by Donald, a son of Malcolm MacHeth (now a prisoner in Roxburgh Castle), and a nephew of the famous Somerled Macgillebride of Argyll. Somerled won from the Norse the Isle of Man and the Southern Hebrides; from his sons descend the great Macdonald Lords of the Isles, always the leaders of the long Celtic resistance to the central authority in Scotland. Again, Malcolm resigned to Henry II. of England the northern counties held by David I.; and died after subduing Galloway, and (on the death of Somerled, said to have been assassinated) the tribes of the isles in 1165. Ambition to recover the northern English counties revealed itself in the overtures of William the Lion,—Malcolm’s brother and successor,—for an alliance between Scotland and France. “The auld Alliance” now dawned, with rich promise of good and evil. In hopes of French aid, William invaded Northumberland, later laid siege to Carlisle, and on July 13, 1174, was surprised in a morning mist and captured at Alnwick. Scotland was now kingless; Galloway rebelled, and William, taken a captive to Falaise in Normandy, surrendered absolutely the independence of his country, which, for fifteen years, really was a fief of England. When William was allowed to go home, it was to fight the Celts of Galloway, and subdue the pretensions, in Moray, of the MacWilliams, descendants of William, son of Duncan, son of Malcolm Canmore. During William’s reign (1188) Pope Clement III. decided that the Scottish Church was subject, not to York or Canterbury, but to Rome. Seven years earlier, defending his own candidate for the see of St Andrews against the chosen of the Pope, William had been excommunicated, and his country and he had unconcernedly taken the issue of an Interdict. The Pope was too far away, and William feared him no more than Robert Bruce was to do. By 1188, William refused to pay to Henry II. a “Saladin Tithe” for a crusade, and in 1189 he bought from Richard I, who needed money for a crusade, the abrogation of the Treaty of Falaise. He was still disturbed by Celts in Galloway and the north, he still hankered after Northumberland, but, after preparations for war, he paid a fine and drifted into friendship with King John, who entertained his little daughters royally, and knighted his son Alexander. William died on December 4, 1214. He was buried at the Abbey of Arbroath, founded by him in honour of St Thomas of Canterbury, who had worked a strange posthumous miracle in Scotland. William was succeeded by his son, Alexander II (1214-1249). Under this Prince, who successfully put down the usual northern risings, the old suit about the claims to Northumberland was finally abandoned for a trifling compensation (1237). Alexander had married Joanna, daughter of King John, and his brother-in-law, Henry III, did not press his demand for homage for Scotland. The usual Celtic pretenders to the throne were for ever crushed. Argyll became a sheriffdom, Galloway was brought into order, and Alexander, who died in the Isle of Kerrera in the bay of Oban (1249), well deserved his title of “a King of Peace.” He was buried in Melrose Abbey. In his reign the clergy were allowed to hold Provincial or Synodal Councils without the presence of a papal Legate (1225), and the Dominicans and Franciscans appeared in Scotland. The term King of Peace was also applied to Alexander III., son of the second wife of Alexander II., Marie de Coucy. Alexander came to the throne (1249) at the age of eight. As a child he was taken and held (like James II., James III., James V., and James VI.) by contending factions of the nobles, Henry of England intervening. In 1251 he wedded another child, Margaret, daughter of Henry III. of England, but Henry neither forced a claim to hold Scotland during the boy’s minority (his right if Scotland were his fief), nor in other respects pressed his advantage. In February 1261-1262 a girl was born to Alexander at Windsor; she was Margaret, later wife of Eric of Norway. Her daughter, on the death of Alexander III. (March 19, 1286), was the sole direct descendant in the male line.